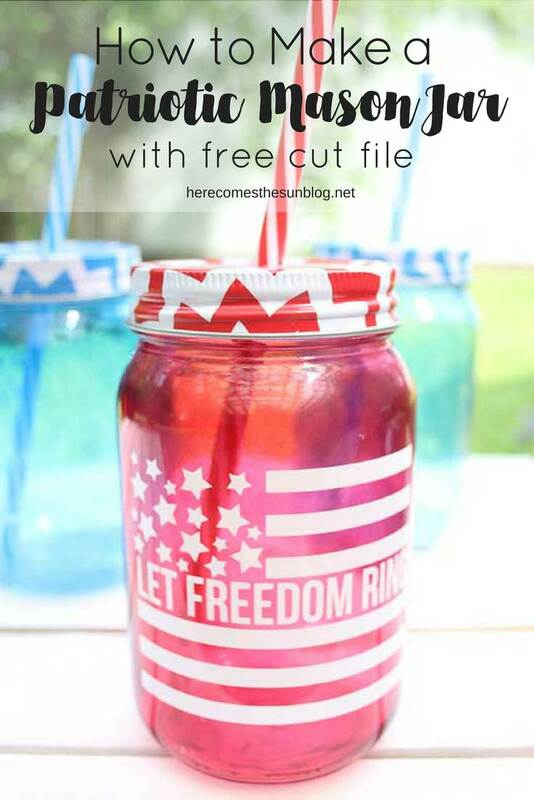 Use this free July 4th Cut File to make your own DIY Patriotic Mason Jar. Fourth of July is almost here and I have to say that it may be one of my favorite holidays. I just love the red white and blue color combination and I get giddy each year at this time over all the patriotic projects there are to make. 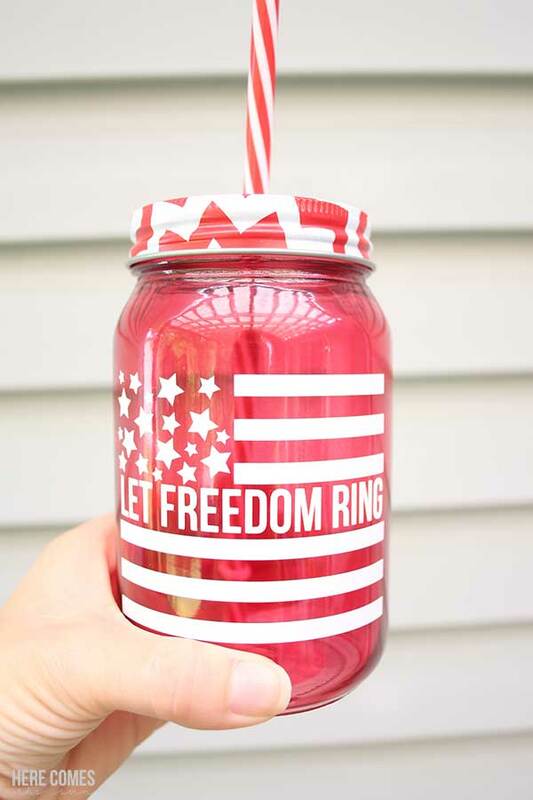 Today I’m going to show you how to make a DIY patriotic mason jar using some supplies from the dollar store. This project is cheap and will wow your party guests. I love decorating mason jars. They are cheap, classic and there are so many possibilities. A lot of people use mason jars for decor but here in the South, we use mason jars as cups. My kitchen cabinets are full of them and if you can’t find any in my kitchen cabinets, then there is surely a stash in my craft room closet. There’s nothing more patriotic than the American flag so that’s what I decided to decorate my mason jar with. Mason jar- You can get these at the dollar store. They come in many colors and options. Let Freedom Ring cut file . You can access it in the resource library, below. I recommend this because it is permanent outdoor vinyl and will hold up during washing. Always hand wash.
Download the free cut file here. Please note that this cut file is for personal use only. You may not sell or redistribute it. Open up your cut file in Silhouette or Cricut software (or any other cutting machine software that can use SVG files). You’ll need Silhouette Designer Edition to open SVG files. Resize the file to fit your mason jar. Cut out the file using your Silhouette, Cricut or other personal cutting machine. In order to cut each section in a different color vinyl, fill the stars with blue, the stripes with red and the words with the color of your choice. You can find a more in-depth tutorial on how to cut by fill color here. Once the file is cut, weed excess vinyl from around the design. Apply transfer tape to your design, apply the design to the tumbler and then remove the transfer tape. Here are the two versions that I made. I know… one of them is not a mason jar but I just couldn’t resist putting the design on a tumbler as well. I just want to show you the versatility of the cut file and the many ways that you can use it. I like both of them but I really like the red mason jar the best. I think the white vinyl really pops against the red. 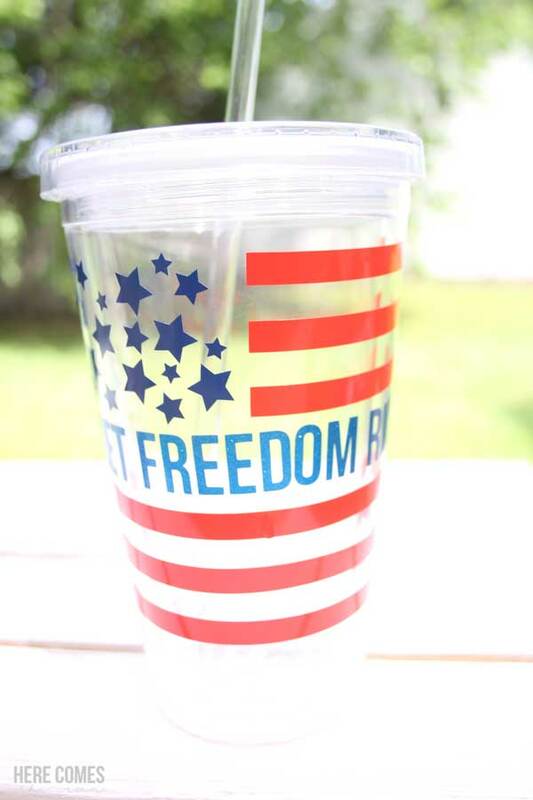 Plus, it took a lot less time than the tumbler with multi colors of vinyl.